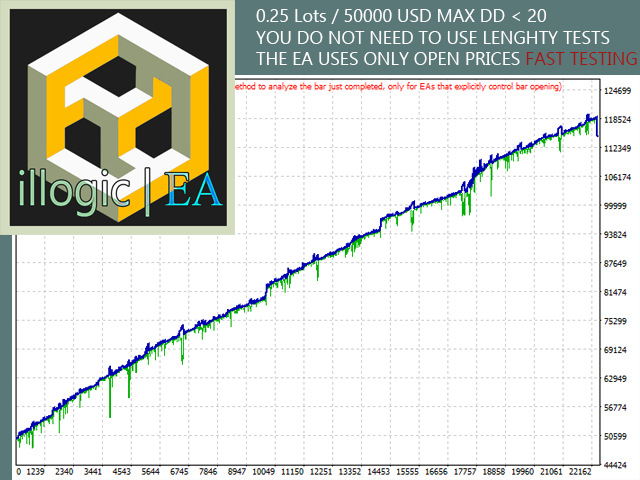 Illogic EA Lite is an EA that works on accumulation of trades on hedging basis. It uses trades on both directions and takes profit in a few different ways. A cycle starts with trades each period of timeframe it is set on. Trades are placed on both directions. When the internal system decides to take profit it closes profit trades. The system will provide a way to close each cycle when the system reaches the specified profit on Equity. As the system creates more trades on specific points it will take profit until equity reaches the specified profit. For this system you need to use a broker that accepts Hedging. It does not use martingale although it accumulates trades in an averaging manner. Any timeframe and profit values is welcome. It carries a level of risk but the system can be controlled internally with a couple of buttons that close all profit trades. It is interesting to analyze the market to control the amount of lots that is opened each moment, as it can be used as a semi-automated system. Everyone is welcome to test and find the best ways to use it. Minimum balance required is 2000 USD or 2000 cents. For first tests it is better to get used to the system in Cent account. Any questions you are welcome you to contact me or comment. Distance for Display: How many pixels to the right of the Chart to display. Equity to close all: How much equity should be added to initial equity of cycle to close all trades. Lots amount: Lot size to open trades as hedged trades. Magic Number: Magic number to use (please use individual Magic Number for each instance of EA used). Use per cent equity SL: Use equity stop out or not. True or False. Equity DD to allow: How much Equity loss in per cent to allow for each cycle. If reached it closes all trades. As you see, Equity to close all trades is related with lot amount. So it allows users to choose the right proportion in which equity reached is used.